No. No. Their pot stickers are expensive, although worth it, but I really don't have the cash for fresh pot stickers, as enticing as the idea is. I had to go out today to get those three colors of floss I don't have for this stitching project. 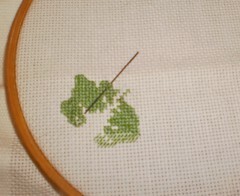 I have some old floss in probably close to the right colors but this particular project needs to be done as directed. Once I've done it, if I do it again, I can say, "Oh this is close to that" and use 'this' up. Until that time, I stick to the numbers. After getting my floss, the temptation for pot stickers became too strong. 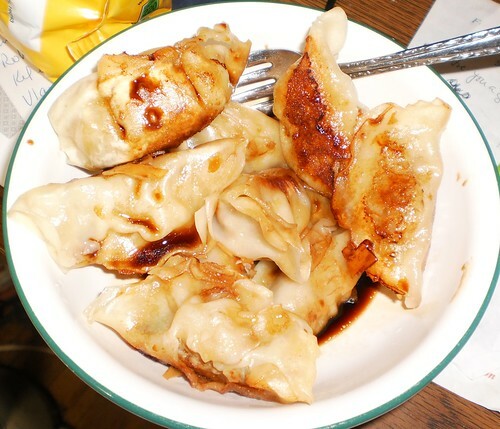 Instead of sitting for 20 minutes while fresh pot stickers were made, I went to Dominicks. A brand named 'Ann Chun' has frozen chicken and vegetable pot stickers. There are 11 in a bag (at least the bag I opened) and they are $4.99 a bag. At the restaurant, you get 6 for $6.95. The frozen ones claim to be organic and with no MSG. I think I'm getting a better deal. When cooked, they looked just like the ones I remember from the restaurant. They tasted just as good as the restaurant ones. In walking to the frozen section, I had to pass by the candy aisle. No feet! Don't go down that aisle! You really shouldn't be looking. It's an unplanned expense and those will sink your carefully prepared budget. They are on sale! And this is a good snack to eat while stitching. (sigh) Okay fine. While you're at it, pick up a bottle of maple syrup so you can make pancakes in the morning, says the brain. So, I have yielded to temptation. Probably not a good thing. It says "Party size" on the bag. I'm a party. Ah the smell of a freshly opened bag of M&M's with peanuts. Darned Dominicks for having the bag on sale. Yes, I worked more on the stitching when I got home, in between dishes and then making pot stickers. Today's work is this. 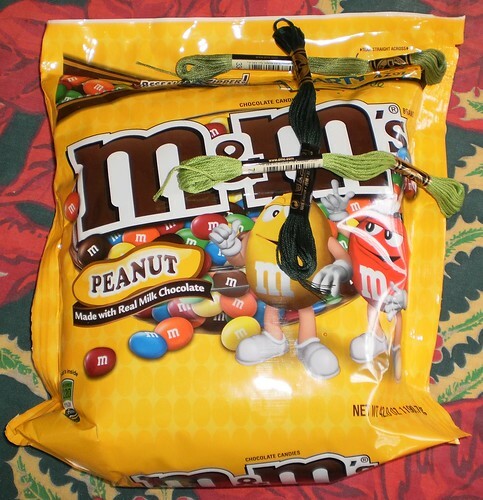 And yes, M&M's with peanuts are perfect for noshing between stitches. Get out of my brain! I was just craving pot stickers the other day!! They have great ones at Big Bowl - but they are small and you only get 5 and I think they are like $8! Yikes!